Home Office 365 Group PowerShell How to Delete Office 365 Group using PowerShell? How to Delete Office 365 Group? As an admin, you can delete office 365 groups through Microsoft 365 admin center. 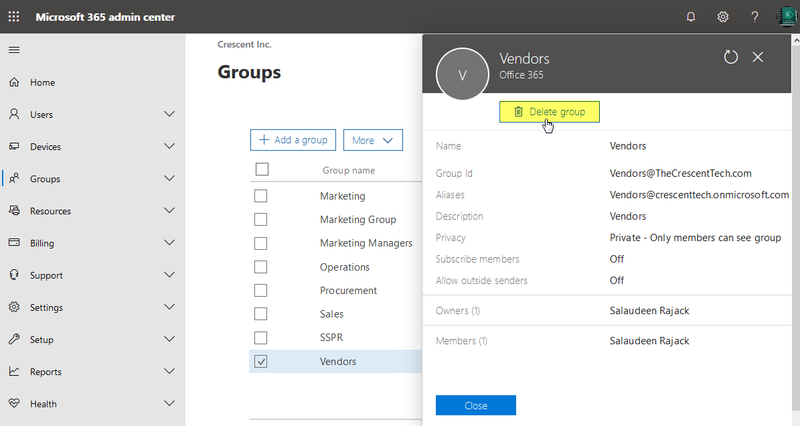 Expand Groups and Click on Groups in the left navigation. Select the Office 365 group to delete. In the details pane, Click on "Delete" button and confirm delete group in Office 365. Please note, the Identity parameter takes: Name, Display Name, Alias, Email Address, GUID, etc. Also the Remove-UnifiedGroup cmdlet prompts for delete confirmation. Here we've suppressed it with -Confirm:$False switch. When you delete a Office 365 group, you are permanently removing all resources of the group, including mailbox conversations, SharePoint site, notebook, and Planner tasks. If you deleted the group by mistake, you have 30 days to recover it! Let's see how to hard delete office 365 group using PowerShell. How to Permanently Delete Office 365 Group using PowerShell? Pr-requisites: You need to have Azure Active Directory Module installed! You can check if you have Azure AD module 2.0 installed by: Get-InstalledModule. If you have previous versions of the module installed, You may have to uninstall using "Uninstall-Module AzureAD" and then install the latest version using "Install-Module AzureAD" cmdlet. Here is how to permanently remove Office 365 Group using PowerShell: Assuming you have Office 365 global admin permissions, Open Windows PowerShell as Administrator. Connect to Azure AD by typing Connect-AzureAD cmdlet. This opens Sign-In page for azure AD. Enter your credentials and Sign-in. Retrieve deleted groups using: Get-AzureADMSDeletedGroup cmdlet. This returns all deleted groups with their IDs.